Saturday April 7th 1923 I reached Chatanooga at 10.45 and with a lady I met went directly to Hotel Patten. We took the trip to Look Out Mountain in the afternoon. It was 5.15 when we got back. I had some supper and went to the depot before ten oclock and left at 11.30. I was very tired. Sunday April 8th 1923 I reached Cincinnati in time for a train to Chillicothe at 12.30. I found Major Briggs and family there. They soon left for Columbus. In the evening Mr & Mrs Marion Dunlap were there. Letters from Hattie and Edith Whetstone. Monday April 9th 1923 I wrote to Hattie and cards to other. Letters from Ida and Warner McCall. Mrs Dunlap here late in afternoon. We all walked down town. Evening at home. 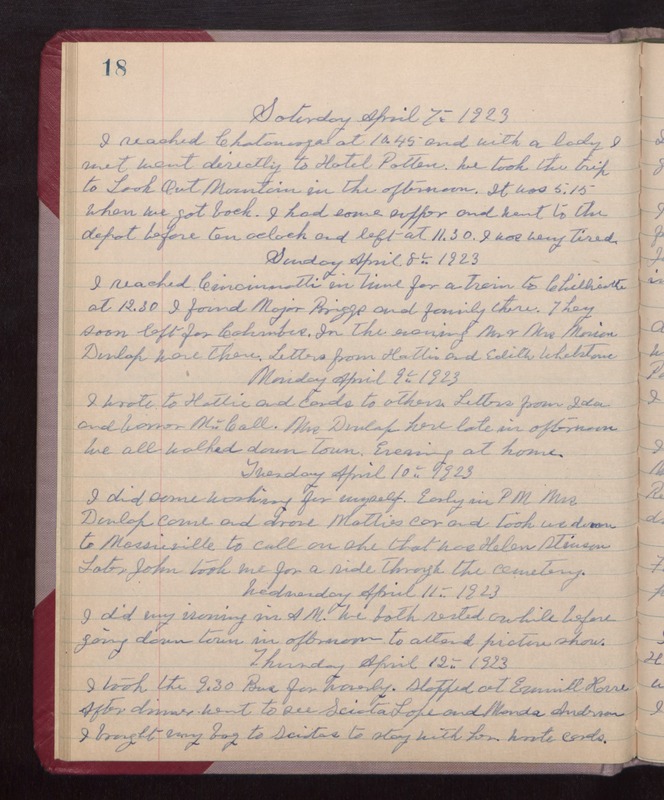 Tuesday April 10th 1923 I did some washing for myself. Early in PM Mrs Dunlap came and drive Matties car and took us down to Massieville to call on she that was Helen Stinson. Later John took me for a ride through the cemetery. Wednesday April 11th 1923 I did my ironing in AM. We both rested awhile before going down town in afternoon to attend picture show. Thursday April 12th 1923 I took the 9.30 Bus for Waverly. Stopped at Emmitt [House?]. After dinner went to see Sciota Lape and Monda Anderson. I brought my bag to Sciota to stay with her. Wrote cards.